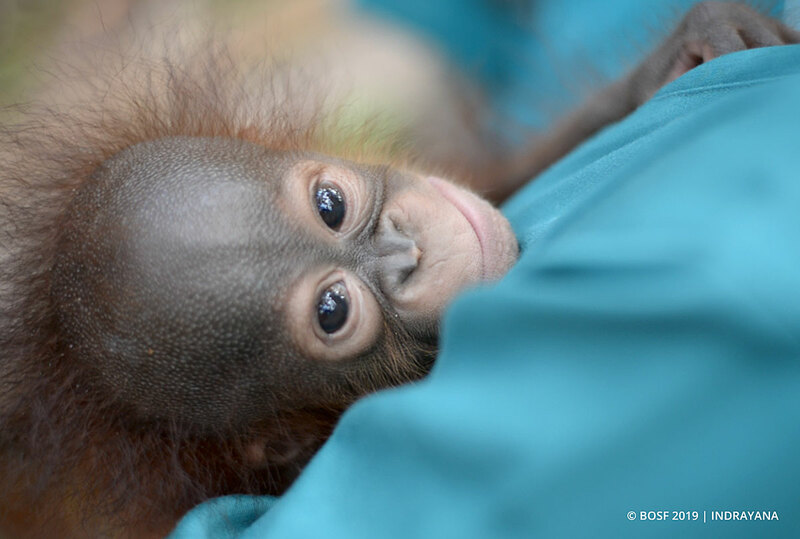 March 20, 2019 — At the beginning of March, the BOS Foundation requested help from our global supporters in naming a 6-month-old baby orangutan who had recently arrived at the Nyaru Menteng Orangutan Rehabilitation Centre. We were delighted with the response! From the many suggestions submitted, the name ‘Greta’ – of German origin, meaning ‘pearl’ – was chosen for our beautiful little girl. This name is also a nod to Swedish activist Greta Thunberg, for her tireless efforts in combatting climate change. Greta arrived at Nyaru Menteng on 18 February, after being rescued by the Central Kalimantan Natural Resource Conservation Agency (BKSDA) in Sampit, East Kotawaringin Regency, Central Kalimantan. In similar circumstances to the many other rescued baby orangutans who end up at our centres, Greta was found alone, without her mother. Upon arrival, she was utterly exhausted and weak. One of her arms appeared to have been broken or fractured in the past, but it seems to have healed well on its own. After a month of care at Nyaru Menteng, Greta has made some sound progress and is slowly recovering. She is more active now and growing more confident. She has also adapted quite well to her new environment and is getting used to being surrounded by her human surrogate mothers. 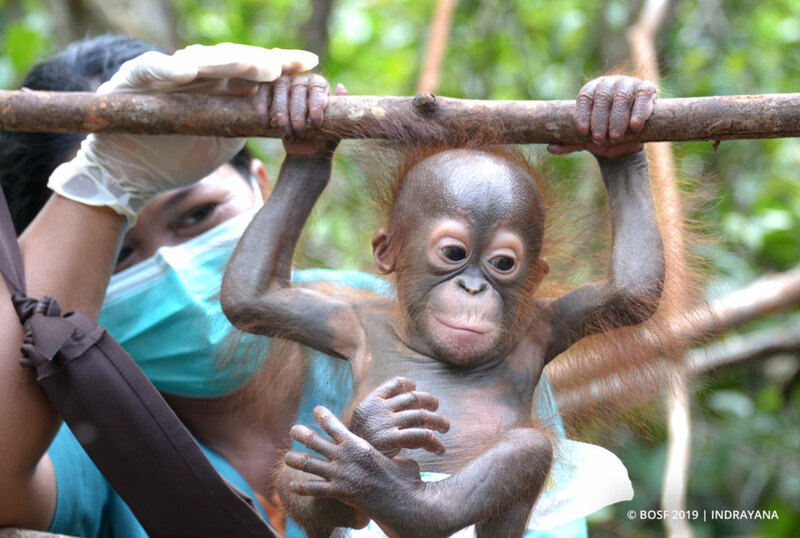 At 6-7 months of age, Greta is yet to master her climbing skills; she prefers to swing instead, or rest in the arms of a surrogate mother. Thanks to the love and care provided by our veterinarians and team of human surrogate mothers, Greta is beginning to pick up some basic skills and natural behaviours. Under the watchful eyes of our staff, she has been enjoying play time in the Forest School area located near the quarantine facility. Greta has also learned to grip onto small branches and dangle from them, and has even taste-tested some young leaves. Like all baby orangutans, Greta loves to drink milk! She is also consuming some soft fruits, which is great for increasing her dietary diversity and improving her nutrition. Greta currently weighs 2.9 kilograms, which is within the normal weight range for her age. She still needs to undergo quarantine for the next two months, however, to ensure she is in the best health possible prior to joining the Nursery Group and continuing her rehabilitation journey. So far, it seems that Greta’s rehabilitation is off to a good start.